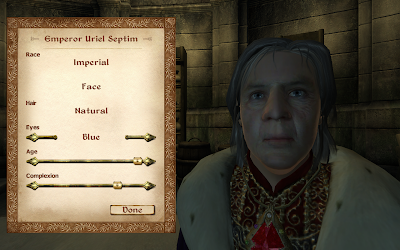 This mod allows you, the player, to be the Emperor in Oblivion: Uriel Septim. In this mod you will have various perks since you are the Emperor. You will have access to the blades as your body guards, access to the whole Imperial Palace, the Emperors Chamber, and the top of the White Gold Tower! Take advantage of Uriel's Unique Factions and Voice - you can make your character speak random dialogue recorded by Patrick Stewart for Uriel Septim! And, when you attack, he might throw out a few words as well. This picture features Radagast Smoking a Pipe. Get your own smokable pipe for TESIV Oblivion.